A family-owned trattoria, La Subida has been in the hands of the renowned Sirk family since it was opened by Josko Sirk and his wife Loredana in 1960. Originally run as a small osteria and inn, the estate has grown with the family to now encompass welcoming rooms and chic accommodation options, an enticing bistro, and the highly acclaimed Michelin-starred restaurant for which it is famous. Welcoming is the key feeling evoked at La Subida – it is the family’s home themselves, and their aim is to make all their diners and guests feel equally at home. The combination of stunning surroundings, peaceful woodlands, and excellent hospitality seems to be doing the trick – La Subida has attracted some of the world’s greatest culinary names, including René Redzepi, Alberto Adrià, Alex Atala, and David Chang, for their holidays. The building itself is a charming, post-war country house with an open courtyard, filled with sunlight and greenery to welcome guests. There is a rustic feel throughout, with exposed wooden beams and tiled flooring in the dining room and memories of the family’s time at the estate decorating every surface: coffee mokas shelved as tributes to their days of service, copper pans and ceramic jugs hanging from the walls. Yet the memories only echo the truly vibrant, lived-in feel of the restaurant, with baskets of fresh fruit and vegetables on the window sill, fragrant flowers on the tables, and even freshly baked cakes resting by the reception desk. Beyond the setting, diners come from far and wide to sample the food of chef Alessandro Gavagna, who became part of the family through his marriage to Josko’s daughter, Tanja. Having worked at the restaurant for many years, Alessandro is well-placed to continue the family’s traditions and passions in the restaurant, and takes inspiration from both their history and the surrounding border region. This results in a combination of Mediterranean, Central European, Friulian and Slovenian flavours coming through in his dishes. The eclectic tasting menu and à la carte options reflect these influences in a mixture of classic dishes with contemporary twists, mixing old and new as well as Italian and Slovenian. There might be dishes such as traditional Agnolotti pasta stuffed with burrata and mint, alongside Slovenian dumplings (Zlikrofi) and Apple strudel. The menus change with the seasons and are matched by an extensive wine list, making the accommodation on offer all the more appealing. 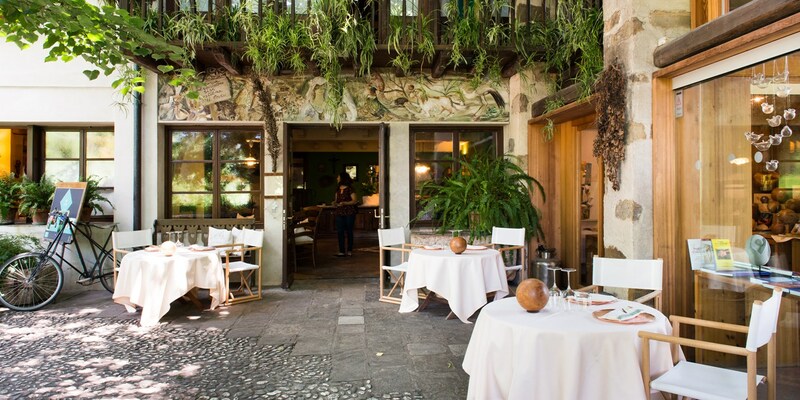 Although in a ‘fairy-tale’ setting in the countryside, La Subida is situated in Cormòns, which is actually only a 15–20 minute journey from the city of Udine on the veloce, or fast train. 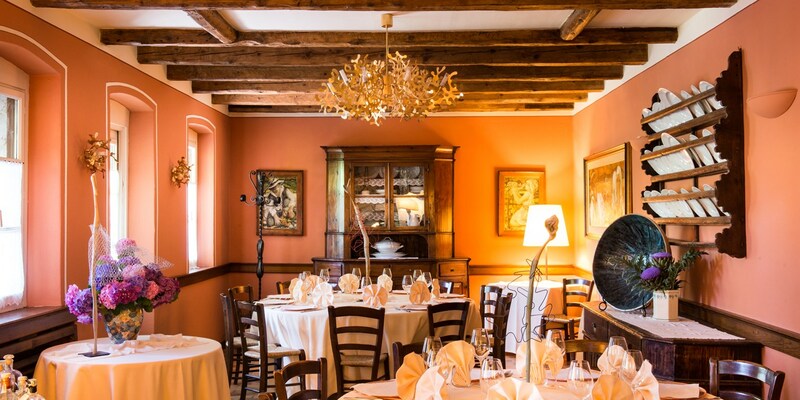 Alongside the main restaurant, La Subida also includes a homely trattoria which is open every evening, serving traditional Friulian and Slovenian dishes that showcase the best of the regions. If you are lucky enough to stay at one of La Subida’s beautiful pine lodges, you can also hire a Vespa bike and take a ride through the surrounding vineyards of Cormòns. This is a brilliant way to discover some of the region's top wine producers. 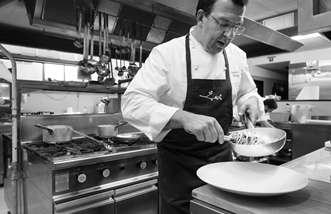 Alessandro Gavagna can't imagine a world in which he didn't grow up to be a chef. At a push, he could have ended up as a mechanic ('I enjoyed taking mopeds apart as a kid'), but his heart wouldn't be in it; food has dominated his life ever since he was young thanks to his upbringing in beautiful Friuli, next to the Slovenian border in northern Italy. Born in 1972, he can remember having his arms elbow-deep in pasta dough as he helped his mother make pasta in the kitchen. It was this – plus all the amazing ingredients on his doorstep – which led him to enrol at a catering college at fourteen. After a few brief placements at small local restaurants, he moved on to La Subida in Cormons when he was eighteen. He's worked there ever since, rising through the ranks to become head chef. La Subida celebrates the flavours of the region. 'The food I cook is the cuisine of where I'm based,’ says Alessandro. ‘There's a mix of Mediterranean, central European, Friulian and Slovenian dishes, which I try and evolve and bring attention to.' He's devoted his life to the restaurant, and even married the owner's daughter during his time there.